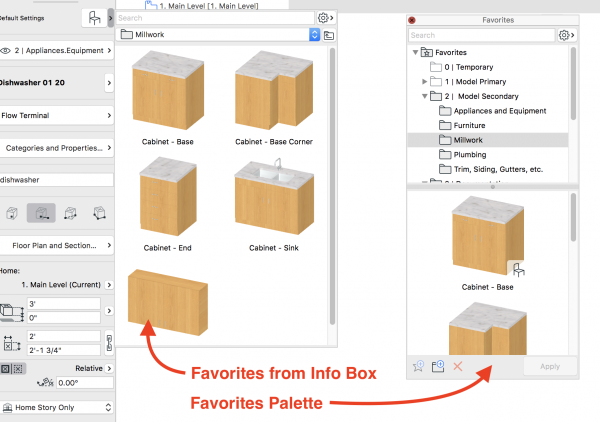 Favorites received a much needed overhaul in ARCHICAD 20. 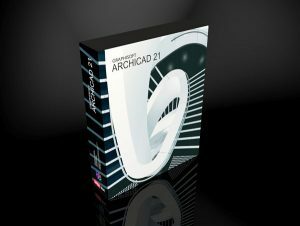 Let’s examine the current state of Favorites and then look ahead to ARCHICAD 21 enhancements that will further supercharge Favorites. The three primary ways to access Favorites are via the Favorites Palette, the arrow button next to the Tool icon in the Info Box, or from the Favorites star icon at the top left corner of the settings dialog box of the opened Tool/element. I recommend you create a keyboard shortcut for the Favorites Palette as there is no default KBS. I use (shift+~) for my Favorites Palette keyboard shortcut and think that’s what you should use too. The required hand gesture is easy to make and your left hand should be resting near that side of the keyboard anyways. The KBS both opens and closes the palette making it very easy to open the palette, do what you need to do, and then close it before continuing your work. Since ARCHICAD remembers where a closed palette last resided, I position the Favorites Palette next to my Info Box so that both the Info Box Favorites flyout and the Favorites Palette show up in roughly the same spot. In my ARCHICAD 19 Work Environment, I used to dock the Favorites Palette below the Info Box on the left side of my screen. Now with the fly out from the Info Box, I keep the Favorites Palette hidden unless it’s needed, maximizing the vertical space for my Info Box. 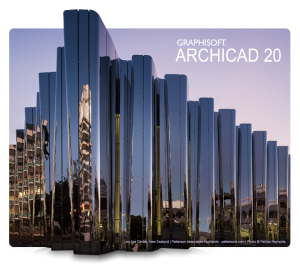 Favorites in ARCHICAD 20 are much easier to create, edit, and delete than in previous versions. On top of that they offer a lot of organizational flexibility. Favorites can now be organized into folders. I’ve seen many different organizational methods for Favorites folders. Some users follow IFC Classification—there are folders for Furniture, Beam, Site Geometry, Flow Terminal, Footing, etc. 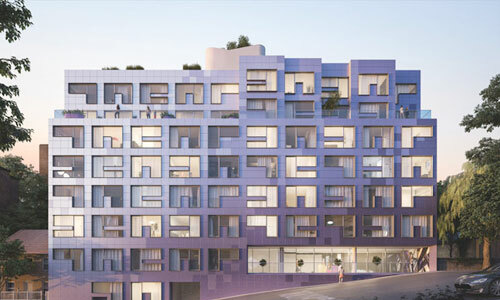 I appreciate this methodology because it reinforces the importance of IFC and Classifications (which will be all the more valuable in ARCHICAD 21). I’ve seen others that group Favorites by project phase (SD, DD, CD) or discipline (Arch, Struct, MEP, etc.). Some build their favorites around specifications sections. Others have a Favorites folder for every Layer. My preferred approach is to base Favorite folders on my Layer organization. I group my Layers in numbered categories: Model Primary, Model Secondary, Documentation, Site, Structural, etc. I then have identical categories in my Favorites. I find this works very well because every element I place needs to fit within my Layer structure (or my Layers need to adapt) and thus every Favorite I save needs to fit within this framework as well. While I mimic my Layer groups in my Favorites, I don’t replicate my Layers. I find that beyond the major groups, the value of grouping by Layer for Favorites breaks down. I don’t need a Favorites folder for interior walls, exterior walls, and half walls. I just need a walls folder. Likewise I have different Layers for floors, ceilings, and roofs (structure and finish), but find I only need one folder for floor/ceiling/roof finishes and one for floor/ceiling/roof structure. There are also instances where I need more folders than Layers or folders for Layers that don’t exist (windows and doors, for instance). You can see my folder structure to the left. Much like total number of Layers, there’s a sweet spot for how many Favorites folders you want. Not too many, but not too few. Whether you go with my solution, something IFC focused, or another system, make the Folder organization support your workflow and how you think about projects. Having used my Layer groups/Favorite Folder structure for about a year, I have found that it has improved how I think about working in ARCHICAD. I am now more conscious of what I am modeling at all times. I am always aware of how an element fits into the hierarchy of my project. One organizational method you should NOT use to create your Favorites folders is by Tool type. There’s no value in organizing your folders by Tool type because of built in filtering. 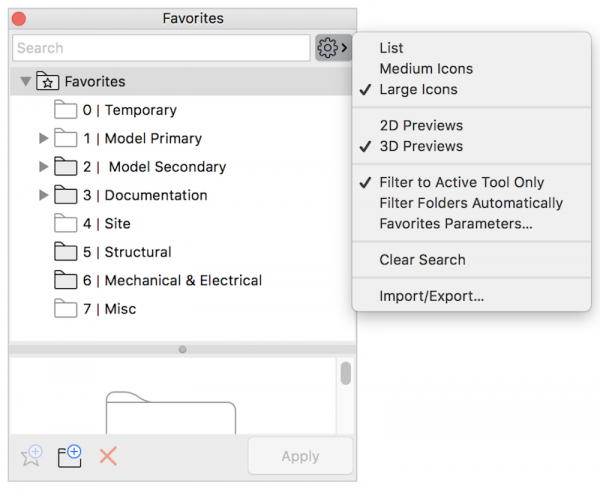 In ARCHICAD 20 you can filter Favorites to only show Favorites of the active tool and to hide folders that aren’t pertinent to your selected tool. Both these options are visible in the image below. If you don’t have Filter Folders Automatically checked, folders without favorites will show with a ghosted icon. If you have this option checked, the folders will disappear. The flyout button from the Info Box automatically shows only Favorites for the Tool selected. In general, I always have Filter to Active Tool Only checked as well as Filter Folders Automatically. Both options make searching for favorites easier. The only time I turn those options off is when I am managing Favorites. If you aren’t already, use the Favorites search box extensively. It’s often faster than scrolling through folders and lists of Favorites, even if all the other features and filters are used to minimize what you’re looking for. Name your Favorites something clear and easy to remember. Their names only show up in ARCHICAD so they should be things that assist the ARCHICAD user. They are internal, not external data. Favorite names should make searching easy. As mentioned above, for folders I use the same numbering system I use for Layers to circumvent the tyranny of alphabetical order. For individual Favorites I use simple, plain text names. By using common language the search function is easier to use. 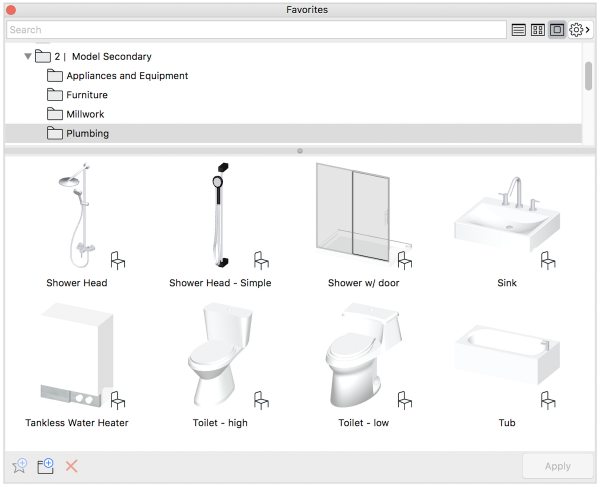 If we have fifty toilet favorites but none of them have the word toilet in their Favorite name (if for instance they are named manufacturer – product name – product number), we can’t use the search function to search for toilets. When working, we usually think “I need to place a toilet,” not “I need to place a <product name>.” If your Favorites include real world products, remember to name them in a way that allows you to find them using both generic and specific terminology. Having a keyboard shortcut (and/or a Toolbar icon) to access Favorites is important because the Favorites Palette is the primary way we add to and edit our Favorites. We need to be able to open and close the Favorites Palette quickly so that management doesn’t break our flow. We can do this management from the Selection Settings, but the Favorites Palette is typically faster and better facilitates making changes as it allows us to select and edit multiple Favorites at once (hold down SHIFT and select as many favorites as necessary). Being able to redefine, edit, duplicate, and rename Favorites makes them very flexible and encourages usage. In days of old, Favorites felt like static things. Now Favorites encourage evolution as editing them is as easy as editing a placed element. From the gear icon in the Favorites Palette there is the option to Import/Export Favorites. 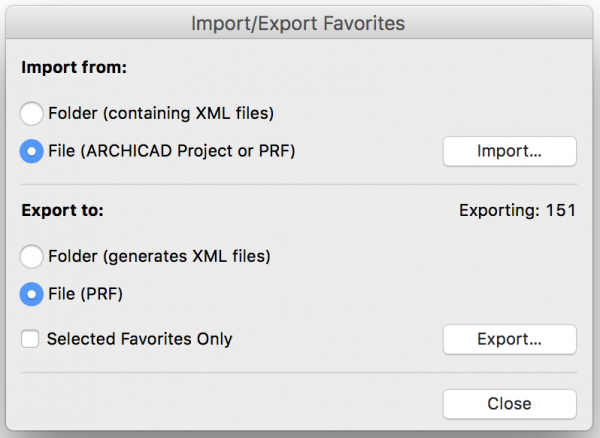 When exporting we can export to a PRF file that contains all the exported Favorites or to a folder which generates individual XML files for each Favorite. In general I recommend exporting to a PRF file. If you select the Favorites you want to export in the Favorites Palette, you can check the ‘Selected Favorites Only’ button to export only a few Favorites. 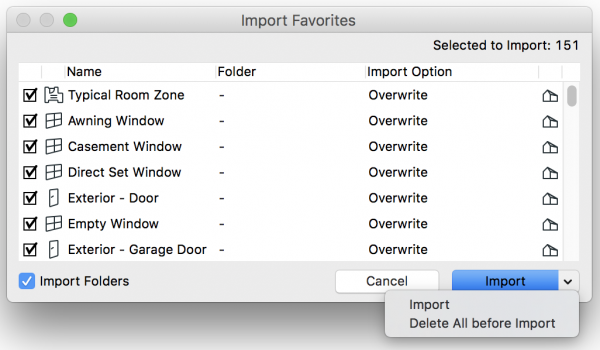 When importing Favorites, you can choose to Import Folders, deselect Favorites you don’t want to include, and delete all the Favorites in the file before importing. You might want to delete all the Favorites in a file before importing if the Favorites you are bringing in are updated from your Template and you don’t want to sort through what’s new and what’s not; or you might be deleting Favorites that pertain to Schematic Design while adding Favorites for Construction Documents; or you may be building your Template and want to delete whatever Favorites are in the base file. Improved access, improved organization, and improved management increase the utility of Favorites. Folders allow us to have as many favorites as we want. If you look at the image above you’ll notice that my template has 151 Favorites in ARCHICAD 20. In ARCHICAD 19 I only had 98. The improvements to Favorites in ARCHICAD 20 increased the number of Favorites in my template by 50%. 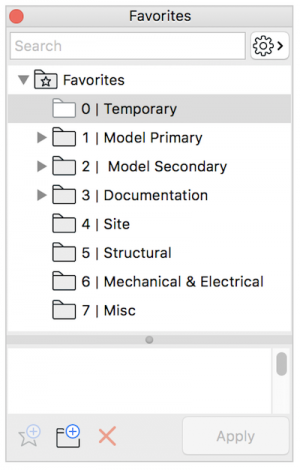 In ARCHICAD 21, I expect to have even more Favorites because there’s no downside to more and more Favorites, to letting your previous work enhance your future work, to not doing things more than once. The only limit to the number of Favorites we have is the time it takes to create them. Every Favorite created saves time in the future. Work done once and incorporated into a template saves time on every subsequent project. 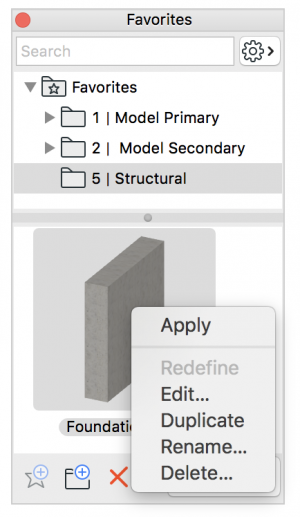 If we make something cool, useful, pretty, amazing, or unique in ARCHICAD, we should encourage ourselves to save it as a Favorite, or turn it into an Object if it’s a group of elements that doesn’t need to be a part of Priority Based Junctions. If we set up a good Lamp Object for a rendering, we should save that as a Favorite. If we tweak some cabinets for a bathroom vanity, we should make them reusable. If we have customized a cased opening but are about to delete it because the project has changed, we should save it as a Favorite first in case we need it later. This allows us to work faster and more fluidly. It gives us more quality at our disposal. Spending twenty minutes to make a sun shade Object just perfect for our needs might feel excessive; but if those settings get saved as a Favorite and become a default for future projects, then designing the next project gets easier. Every nicely saved Favorite means we have one more thing to add quickly to a schematic design. It allows us to create ever more complex imagery earlier and earlier in the design process. Saving Favorites is a way of taking pride in our work. If it was worth making once, it is worth using again. And maybe, just maybe if we all push Favorites to the limit we’ll see that what we really need to do is learn GDL so that we can save Favorites of customized and personalized Objects. 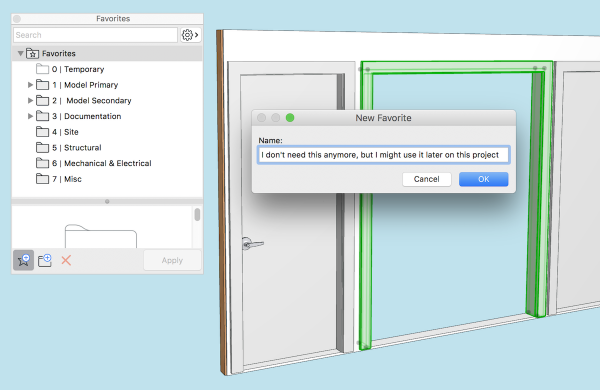 Enhanced Parameter Transfer in ARCHICAD 21 may reduce the number of Favorites we save, but only because it’ll make Favorites even more flexible. Your views on the subject really caught my attention , reminding my of one of the many ways we are underutilizing the tools made available to us with this software. Since I haven’t yet upgraded to v21, I’ll do it in v19 until upgrade time!